Vector is another performance in process along side “Volume Curvature.” There is a similar emphasis on form in space, but the main focalpoint for “vector” is a strong sense of line whereas Volume Curvature often becomes abstracted to the point of texture. Vector is my first project to be created enitrely with open-source software: The Gimp, OpenOffice Draw and Pd/Gem. Volume Curvature is a performance piece settled in the body of work known as Self-Similar. During performance, complex organic volumes are created. I think of these volumetric forms as virtual kinetic sculpture. The colours, structure and style of the piece are inspired by the architectural work of Frank Gehry. The piece is a fusion of the structure of music over time and architecture. This performance is the first iteration of Volume Curvature. In future development the piece will be realized as an interactive installation. Self-Similar is a visual performance piece centered on the fractal theme of self similarity. Self-Similar generates images though an openGL feedback process so that the part resembles the whole. Self-Similar is performed live in response to an audience and musical context. The first version of Self-Similar was performed in 2004 as part of the The Machine Shed Issue #3 Release Party with The Convertible Robots. Threads is a visual performance piece that uses letters and words as the material of the image. Threads is performed live in response to an audience and musical context. The text is generated as a trajectory through the vocabularies of both the old testament and the bible. Feedback is used to build up dense textures of text. Threads was first performed in 2004 as part of Anyware with audio by Jeremy Rotsztain. 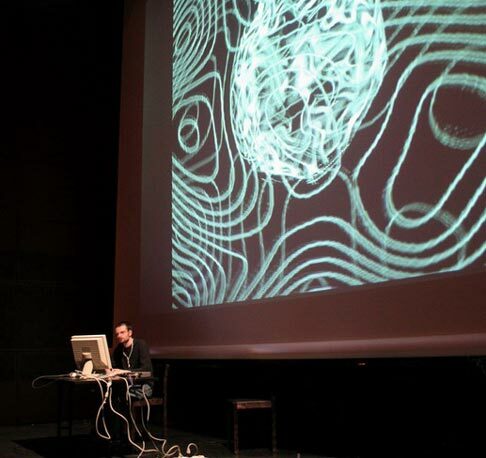 Ben is an installation artist, visual performer and programmer. He works in an open-source context and makes the software he develops available under the GPL. His installations create content live and on the fly in response to the work’s sensed environment. These works may involve interaction from the audience, or the work may simply respond to the context in which it exists. Ben is a structural thinker and imagines his work as the production of media architectures. Physical modelling, chaos, feedback systems and evolutionary algorithms have been used to inform and engage in his creative process. Ben is currently developing the pixelTANGO visual performance software for the Société des arts technologiques.